Cable cover plates form a protective cover for the exposed area of brake cable that connects to the expander in the brake. The cable cover is made up of two plates that slot together and are held in place by the brake cable itself. 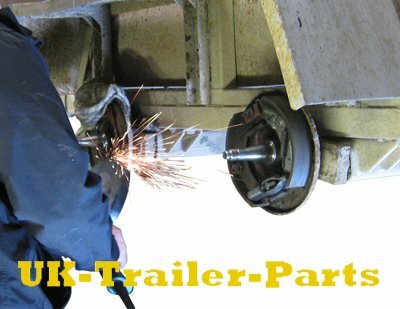 The first of these two plates is permanently fixed to the back plate of the trailers brakes. 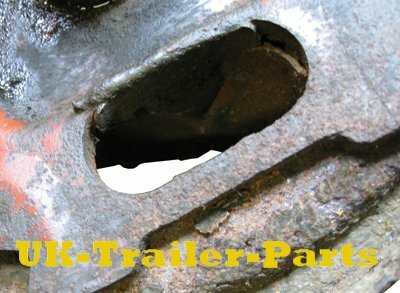 Cable cover plates on trailer brakes are a common area for maintenance as they are usually the first to show signs of corrosion. 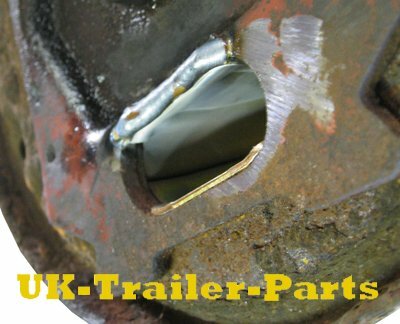 This is because the underside of your trailer is far more likely to suffer the effects of corrosion due to the water and salt picked up from the road. 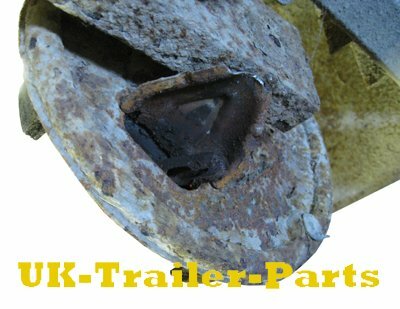 The example below shows a poorly maintained back plate from a brake unit. You can see that the back plate is badly corroded, and the fixed half of the cable cover plate has snapped. 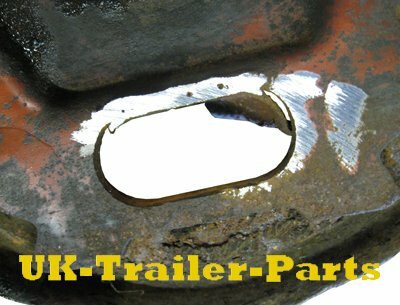 If you are sure that the corrosion to the brake unit is only superficial and there is no severe damage, it is possible to clean it up with a wire brush and replace the damaged cable cover plate. 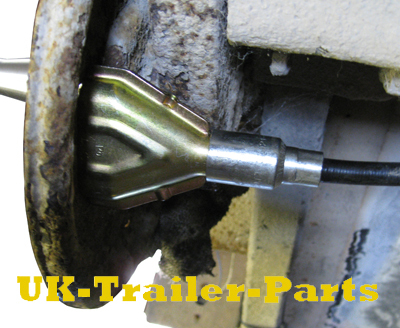 As you can see in the picture below, the hub and brake assembly have to be removed in order to perform these repairs. In order to take off the old cover plate you must remove the weld fixing it to the back plate using a grinder. Take care not to damage any other part of the brake while doing this. 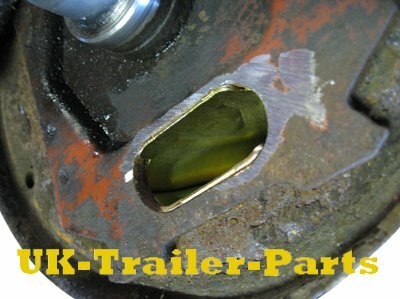 After removing the weld, the old cover plate should not be too hard to separate from the brake back plate. Use a hand file to clean up the area you have just been grinding. Slot both parts of the new cable cover together and position them in the back plate. Next you will have to weld the top cover plate in place. 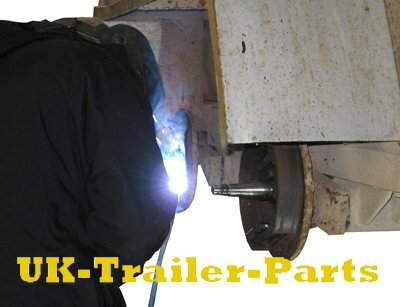 Remember that only the top cover plate needs welding to the brake back plate. 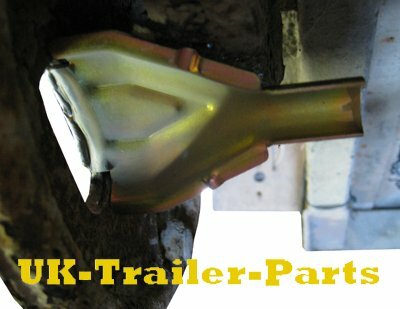 The bottom cover plate is held in place by the brake cable and can be quickly released to allow access to the expander. The weld only needs to be about an inch in length, just enough to hold the cover plate in place. In the example below you can see the top half of the new cover plate firmly fixed to the brake back plate. 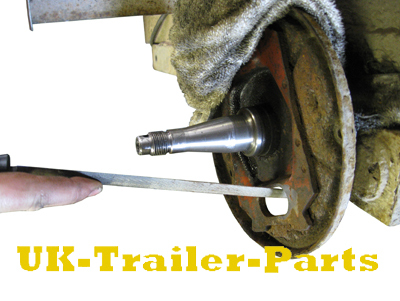 Providing that the expander inside the brake is in working order, you can use a wire brush to clean up the rest of the brake and re-assemble it. Connect the end of the cable to the expander, re-fit the bottom cable cover plate, and slide the metal ‘cup’ of the cable over the ends of both cover plates to hold them together.